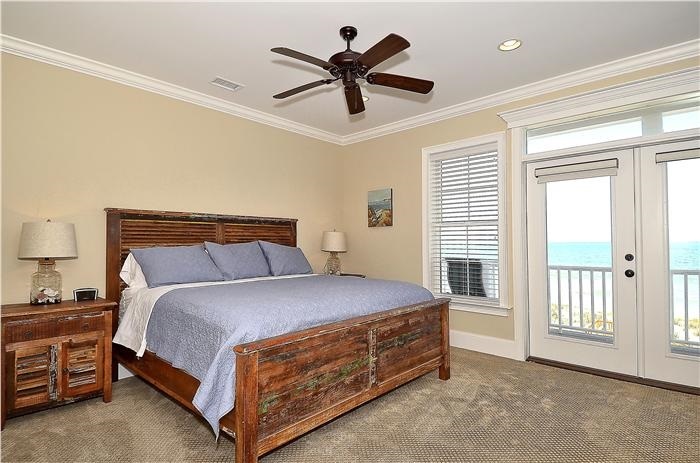 Professionally Maintained Private Pool w/ Kiddie Pool/Hot Tub, (Seasonal Pool Heat Available w/ Fee), Pool Dimensions: Outdoor 20' x 16' in Length/Width and 3' to 5' in Depth, 2 Oceanfront Covered Front Porches 1st & 2nd Levels, Streetside Covered Porch 1st Level, Streetside Sundeck 2nd Level, Outdoor Bar Area w/ Mini Refrigerator, Exterior Shower, Outdoor Bathroom, Paved Parking, 2 Parking Bays, 4 Covered Parking, 8 Total Parking, Professionally Landscaped Grounds, Approximately 3,905 Square Feet, No Pets Allowed, Non Smoking. Professionally Decorated, Elevator to 1st and 2nd Levels Only, Central A/C Heat, Ceiling Fans, High Speed Wi-Fi Internet, Multiple Flat Screen TVs & DVD Players, Additional Sitting Area on 2nd & 3rd Levels, Fully Equipped Kitchen, Washer/Dryer, Range/Oven, Refrigerator, 2 Dishwashers, Microwave. This house was absolutely beautiful. It was extremely well equipped. A couple of the TV's did not work and the refrigerator could have been colder but besides that it was perfect. 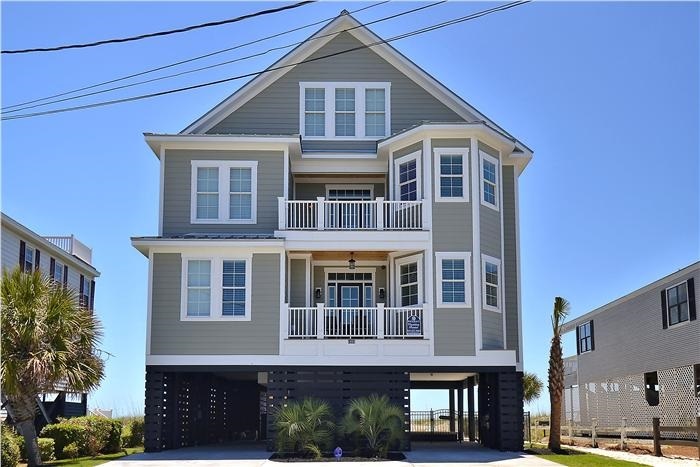 Stayed here with our large extended family, 14 people, for our annnual trip to South Carolina to the beach. 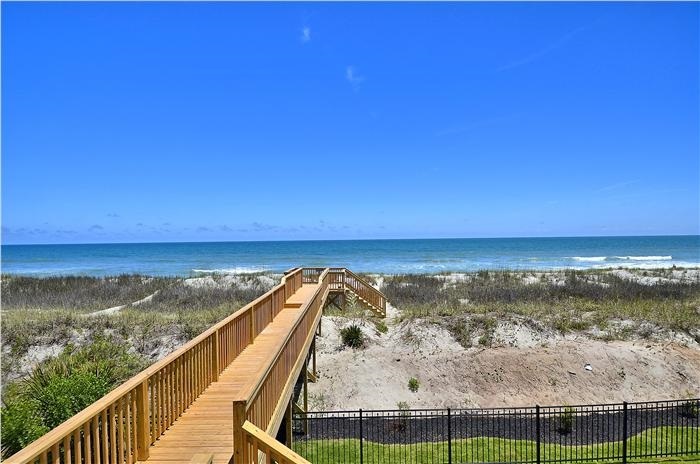 We love the house, we love the beach, we love Murrels Inlet and Garden City! Everything was great, the people who work in the rental office are extremely laid back and friendly. It’s a great vacation. Management company was very helpful, friendly and responsive. Absolutely perfect in everyway!!! The house was amazing for our large family and absolutely wonderful! Cannot wait to go back! The only drawback was the TV in the master bedroom which did not work properly. Fantastic! The house was beautiful and clean. Great 84th birthday f0r me with my family! This was a perfect place for our 20-person family get-together. The location is just far enough away from the action but not too far that it's not walkable. We did have a couple of issues though. The refrigerator/freezer quit working on the first day and we lost some food. However, the repairman was there on Monday and got it working again. We also did not have the promised WIFI. It was not working when we arrived and was not fixed until Wednesday evening. That was frustrating as we had people trying to work and do homework. But....that aside, our vacation was wonderful and we would definitely come back. We rented this house for our large family vacation with 16 people. It was the best house we have stayed in thus far, we had a great time! We had our third (they have been on 6 year increments) family reunion in Garden City. 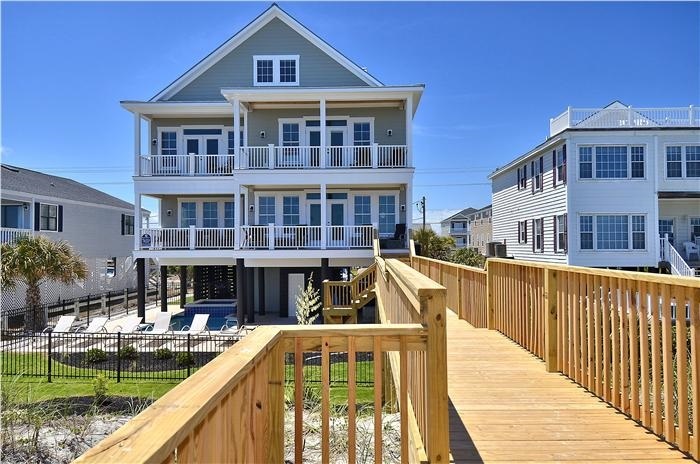 This was the first time we rented a house actually on the beach and Carolina Palms was our home base. In total 5 couples stayed there including 5 kids under 9. The reunion was multi-generational and totaled just over 60 people. We had four evening events at Carolina Palms with most everyone there and used the beach area behind the house as a base for all family beach activity. 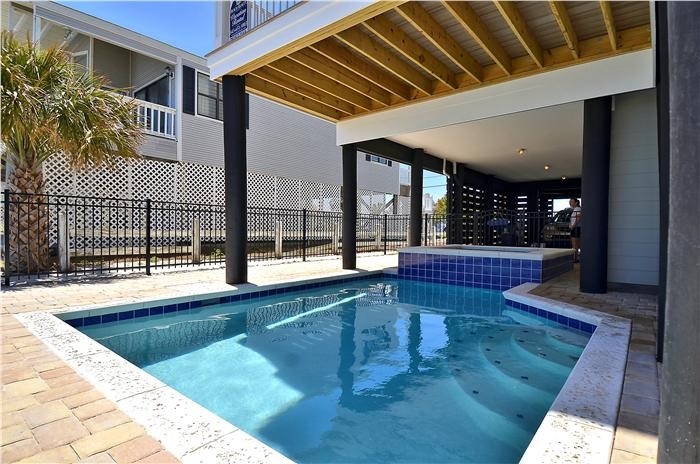 The pool area was a great break place for the kids and the house had great space and utilities for both large parties and multiple families living together. We hope to come back. I HAVE STAYED IN SEVERAL VACATION HOMES BUT THIS HOUSE BY FAR WAS THE BEST. IT WAS VERY,VERY CLEAN AND WAS DECORATED WITH THE NICEST THINGS. IT WAS ALSO HUGE AND MY WHOLE FAMILY WAS ABLE TO STAY. WE ARE HOPING TO RENT IT AGAIN NEXT YEAR. I WOULD RECOMEND THIS HOUSE TO EVERYONE. We recently stayed at Carolina Palms and it was fantastic! It is everything you would ever want in a beach vacation. the house was spacious and provide more than enough room for all my family members to find their own special spot. the kitchen was well stocked allowing us to cook in more nights than we ever have in the past. Beach access was great and it was so nice to be able to get back to the house in just a few steps. I would highly recommend a stay at Carolina Palms! Can not wait to go back next August! I've vacationed in Garden City for 23 years and every year is memorable. Kiki at Beach Realty is extremely helpful and has been for the last 12 years (our prior relationship was at Seaside Rentals). I would also, note this year Dennis and Deisiree were helpful. We are planning to return in 2014. Great house! Very comfortable, very well appointed. We loved it. The pool and hot tub could use some type of hand rail. The steps on the pool are deep and a rail would be helpful. Glad you enjoyed your stay and thank you very much for the comments and suggestions. Had a great time. TV was hard to figure out, but overall, the house was perfect. 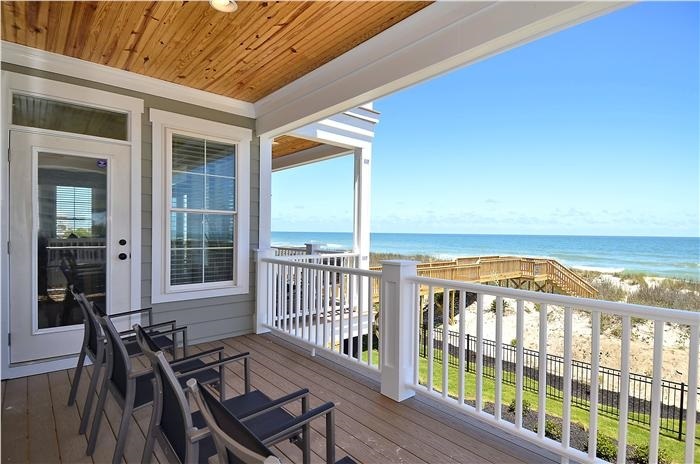 We rent oceanfront houses every year on the same street in Garden City and love it. Carolina Palms is a great house. We've rented many larger homes but found this house to be a great combination of features, size and use of space. It has a great kitchen that makes cooking for large groups possible and the bunk bed room at the top was a hit for our children. At first we were a little concerned the pool would be too small, but actually found the fact that it is tucked under the house in partial shade a good thing given how much sun everyone got on the beach. We wished the decks were a litle wider and joined together as we couldn't use them much for our whole group. You need to rent a grill or provide feedback to the owner to add one. Overall, great house and we're rebooked for next year. Thank you for taking the time to complete the review. We look forward to seeing you and your family next year! Beautiful home! This was our 5th year renting in Garden City and this was best house yet!!!! 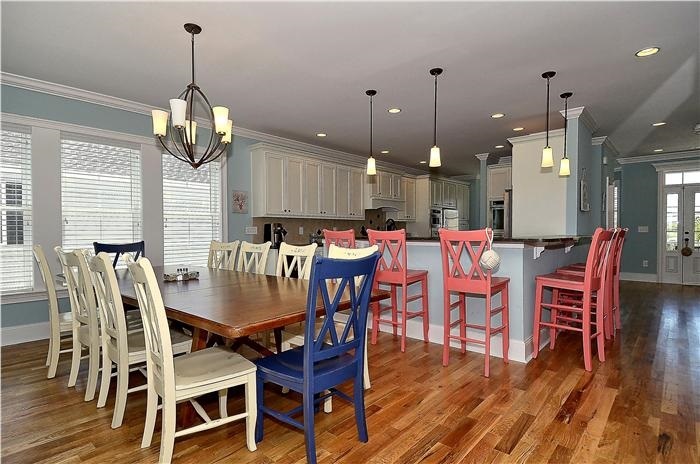 Pictures on site do not reflect how great this home is. Kitchen is amazing and well stocked. Living room was huge with beautiful views of ocean. Pool and hot tub were fantastic, lots of pool toys in closet. House was very clean. Plenty of room for everyone to have their own space. Bedrooms nicely decorated. You can tell owners put their personal touches on decorations and furnishings. Simply a beautiful home! Will rent again! Beautiful home nice size rooms for lots of people. Great beach front location. Did miss an outdoor grill. Thank you so much for completing the survey. We appreciate your feedback. a good time had by all,thank you to the owners for their kindness towards the Army,Navy,Air Force and Taxpayers.The elevator made the trip for the 92 year old Mrs.Patrick more enjoyable for the whole family.Lord willing and the Sea Don't rise see you next time. "Dean"
From the Homeowner and the Beach Realty Team thank you for your patronage! We'd love to see ya'll again soon! 2nd year in this home! Great house, roomy, beautiful views. Kitchen is very large and well stocked. Pool and hot tub was nice. Beach realty staff is great and very attentive. We had our 2 1/2 granddaughter with us, first floor had more than enough space to keep her busy but within eye sight. 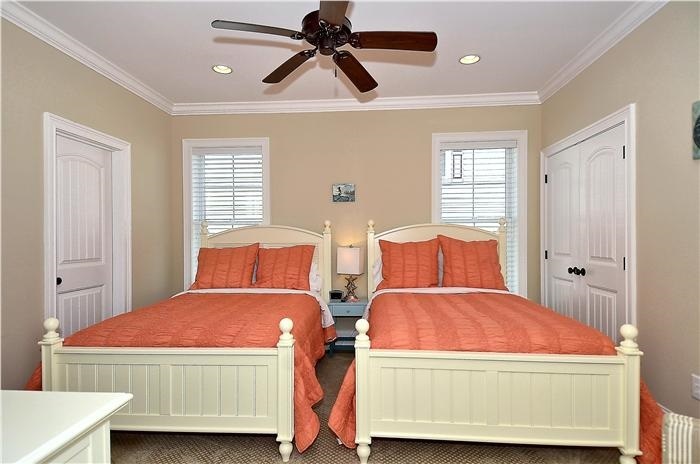 Property is very well maintained. Had beach to ourselves. Great house to vacation in, highly recommend this house. The house was amazing but there were some minor issues with the smoke alarms. Had a wonderful week at Carolina Palms. The kitchen is fabulous with 2 refrigerators, 2 ovens, and 2 dishwashers. The kids from elementary to college aged loved the 3rd floor"bunk room" and all the beds were so comfy. Each of the living spaces were well designed and very clean. We have been gathering in garden city beach for 10 years and this was the best rental of the bunch! Overall we had a very good stay. Very nice home in a good location. Furniture was great and beds were very comfortable. A few of the TVs never ended up working. The one in the kids den wasn't even hooked up. The main TV in the living room was confusing to get working. I was surprised there wasn't a grill at the house. 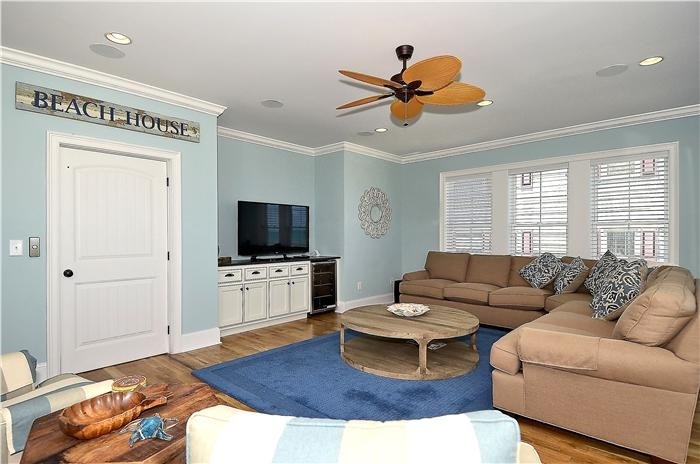 Every other beach home we've rented has always had one. We tried to rent one for the week but they were all taken. The air-conditioner on the main level was never able to keep that level very cool. Management did send someone out to look at it but there wasn't anything that could be done. The kitchen was fairly well stocked but we did end up having to buy a few things. So overall I would say a very beautiful home that could use just a few improvements to make perfect. We spent 2016 memorial weekend in Carolina Palms. The house is equipped with everything that is needed to have excellent time. Pool and hot tube were clean and you have the beach just some steps away. The only thing that was too small is the grill. If you have a large group and want to cook out take your grill. Our family absolutely loved our stay! The property was gorgeous without being fussy. The location was great, clearly doesn't get better than oceanfront, but it's not too far down from the main road (at the Garden City pier) that takes you out to Highway 17. The pool area and hot tub were a big hit for all ages. To sum it up, this was the first house that got a unanimous vote to rent again next year! We loved the house and the pool----especially being right on the ocean. The house is beautiful! The 8 built-in bunk beds are perfect for a family with lots of small children. Two refrigerators and dish washers made food prep and clean-up easy to deal with. Lots of TVs and electronic equipment. Ample sitting areas on each level. Perfect vacation home!!! So happy to hear you had a great vacation and we hope to see you again very soon!